Jakarta, Ministry of Communication and Informatics - To ensure optimal use of ICT in accordance with the Nawa Cita of the Government of Joko Widodo - Jusuf Kalla, it is necessary to involve all stakeholders . One of the important issues that is of concern to ASEAN countries is the security of the digital sector that is related to national strategic interests, and society. Cyber security is the key to the use of ICT, especially for Big Data and internet of thing (IoT) technology. In Indonesia, in accordance with the Critical Information Infrastructure Protection (CIPP) frameworkprepared by the Ministry of Communication and Information, information security aspects include issues of risk mitigation, incident handling, and information recovery.
" We have prepare CIIP for banking, financial, transportation, and energy. 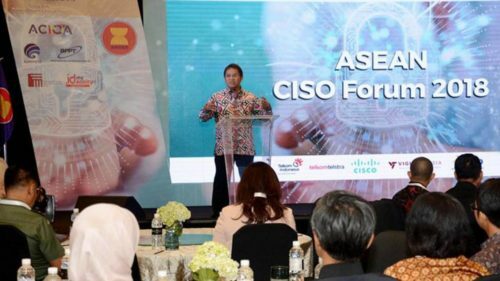 In addition, at this time there is a State Siber and Password Agency (BSSN) as agencies that regulate and supervise the sector, "said Minister of Communication and Information Rudiantara in the ASEAN Chief Information Officer Association (CISO) FORUM, at Pullman Hotel, Thamrin, Central Jakarta, Monday (07/23/2018). The connectivity according to Minister Rudiantara will be useful to provide public services, especially education and health and safety. "At present in Indonesia there are still thousands of schools, health centers or hospitals, Koramil, police stations in sub-districts and villages in Indonesia that are still not connected," he said.